The Stochastics Indicator was developed by a fellow named George C. Lane in the 1950's. It is classified as a momentum oscillator indicator that shows the location of the current close relative to the high/low range over a set number of periods. It shows overbought and oversold readings. Closing levels that are near the top of the range indicate buying pressure, or accumulation, and those near the bottom of the range indicate selling pressure, or distribution. This indicator is plotted on two lines - the %D line and the %K line - with values ranging from 0 to 100. The fast line is simply %K and %D plotted on the same chart. It is subject to quicker moves and can catch more turning points, but is also subject to greater "whipsaw" or false movements. The slow line is less sensitive. The %D of the fast line becomes the new %K, which is then smoothed once again using a three day moving average to obtain the new "slow" %D. Ya I know, this is all pretty confusing. It doesn't really matter what the math is behind its formula though, you just need to understand and know when to use it properly. The slow line is preferred for filtering out market noise and is less prone to violent whipsaws. For further in-depth information on the Stochastic Indicator, this resource contains critical information to help you learn to use stock charts and technical indicators in a clear, simple and concise manner to improve your trade entries and exits in the stock market. As mentioned above, the true value of an Oscillator indicator, is to determine when a stock has reached an overbought level, or an oversold level. As shown on the chart above and on the bottom left hand side, the indicator is shown to be overbought at the 80 position, and oversold at the 20 position, on a scale of 1 - 100. Using a short-term setting, such as 5 days, once an up-trend is identified, when the stock dips and the indicator goes to an oversold level at or below 20, and turns back up, a stock trader can buy at this position. The opposite would be true in a down-trend, with 80 being overbought. This is commonly used in a swing trading system. The most significant and strongest signals given by the Stochastics-Indicator are generated on price divergences between the indicator and the price of the underlying stock. Bull divergences give buy signals. As shown in the chart above, a bullish divergence is shown when the price makes a double bottom in early March, and the indicator diverges and slants up. The price then rallies up higher. It happens again in May. In July, the price is sinking, while the indicator is diverging and staying flat. Sure enough, the price rallies and moves up to around $120. Buy signals are especially strong if the first Stochastic-bottom is below its lower reference line (20 on left hand side), and its second bottom is above it. Bearish divergences are the opposite. 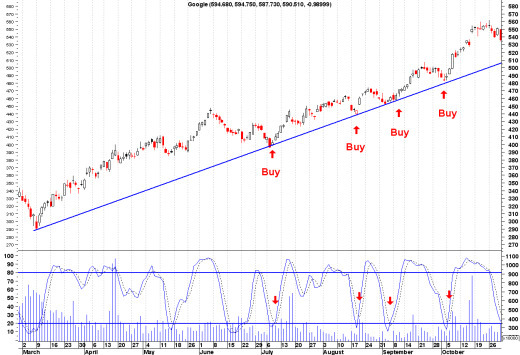 Double Top patterns work well with this indicator. As with this indicator, it is meant to be used in conjunction with other indicators. Interpret Technical Indicators like a Pro! 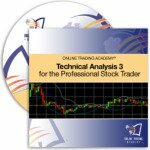 Personalized Course on Technical Analysis Techniques ! Lays the Foundation for Investors to Become Expert Technical Analysts and Smarter, More Successful Traders. Is there a specific Stochastics Indicator Strategy or Technique that you use, that is not described on this page? Here is your opportunity to share your Stochastics Indicator expertise and technique, to help and coach other newbie Stock Traders become more proficient and confident on their journey to Stock Trading Success and Profitability! 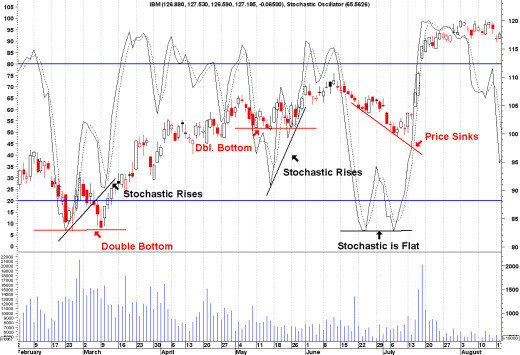 Return From "Stochastics-Indicator" to the Home Page: "Stock Market For Beginners"